It was a hell of a time finding an anthology of Pagan poetry for this weeks review. I contacted three publishers, one author, looked for books in the library, and nothing. Nada. No writer or publisher got back to me. And my local library system has to beef up its selection in terms of Pagan poetry. 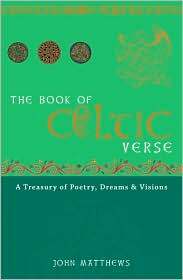 Chris Moore, this weeks featured poet, ran downtown to a used bookstore and found The Book Of Celtic Verse: A Treasury of Poetry, Dreams, & Visions Edited By John Matthews. Chris did this after I told him all the trouble I was having in finding a book to match him up with. “You buy it, I’ll review it, you keep it,” I said. Enough background info, let’s get to the review. Editor John Matthews has written more than eighty books on Arthurian Legends, the history of Grail Studies, and many collections of poetry and short stories. Mathews was a consultant on the film set of King Arthur directed by famed director Jerry Bruckheimer and has been on the New York Times best seller list for twenty-two weeks. So, this 2007 anthology of Celtic Verse, or what Chris Moore and others call Pagan poetry, was put together by someone who knows what they’re doing. WARNING: reading poetry by dead white people is not Black Coffee Poet’s strongpoint. Being raised by women I have always felt very comfortable with people of the female gender, often times preferring their company over that of peoples of other genders. So, it is no surprise that I was struck most by the female carpenters of song in the first section of the book. Ella Young’s The Rose of Silence is a short poem that speaks to her fellow poets. Young is referring to the High-Queen’s doon—her fortress. I do not believe she means a real fortress. Young is not writing of Buckingham Palace. The Queen—Mother Earth—is the poet’s refuge, light, and inspiration. The Rose of Silence being the metaphor for the force behind the many words that flow from Young’s pen, or inked tipped feather or piece of bone (?). Young uses concise language to bring forth gorgeous imagery to the reader. She describes the beautiful pastures of her Celtic land as “green stillness” and a tree in winter as “silver tree”. The Rose of Silence whispers, has you seeing the beauty of Young’s Celtic home, and can be read over and over having the reader notice new things. While included in the section called Spells and Incantation, Young’s poem debunks the myth that poetry by pagans is demonic literature. With silence being a virtue and practice in many spiritual traditions, and nature a gift from Creator revered by many, the spell here is the beauty that attracts gratitude and appreciation by both poet and reader. The anthology has many anonymous writers. My Step Is Heavy, found in the Lover Under Leaf (The Poetry of Love) section, is exactly that—Poetry of Love. Within eight lines the 18th century writer brings forth sentiments that ring true yesterday, today, forever. A broken heart is the inspiration for the poem. A heavy step, heavy heart, heavy breathing, all metaphors for the feeling that can lift you to the skies or smack you into the ground. My burden’s a load for three or four. Who has not felt this? This is real, raw, gutsy verse. It’s not the Tom Cruise line that Hollywood makes its money off of. The reader can relate without being fed falsities of what the most sought feeling in the world is about, and how it can go really well or really bad, the latter in this case. Oh, love is the courtier of my quest. Will you come back, shall I expect you? Shall I ever be free to seek my rest? The experience of loving someone is filled with many questions and answers, and is always a constant learning process. The anonymous writer does not leave the reader guessing but has reader asking similar, or the same, questions the writer is asking. Love is a universal feeling with diverse experiences that we can all relate to somehow, sometime, hopefully. The Book Of Celtic Verse has much to offer. Whether you want to learn about the warrior spirit, history, relationships, ways of living, ceremony, or how to write good, concise poetry that says something, John Matthews has chosen poems that offer a little something for everyone. Enjoy. Tune in to Black Coffee Poet Wednesday October 27, 2010 for an inclusive interview with Pagan poet Chris Moore. This entry was posted in Uncategorized and tagged Anonymous 18th Century Poets, Black Coffee Poet, Buckingham Palace, Celtic Poetry, Celtic World: Brittany, Chris Moore, Cornwall, Ella Young, High Queens Doon, https://blackcoffeepoet.com/, Ireland, John Matthews, Jorge Antonio Vallejos, Mother Eearth, My Step Is Heavy, Poetry of Love, Poetry of Magic, Poetry of the Natural World, Poetry of Vision, The Book of Celtic Verse, The Rose of Silence, Wales, War Songs and Praise Poems. Bookmark the permalink.